Shadow: Wolf Rider attacks the defending player. That player may declare 1 character as a defender. Deal Wolf Rider its own Shadow card. 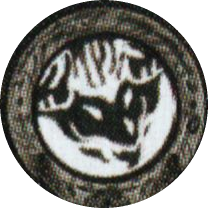 After combat, return Wolf Rider to the top of the encounter deck. When Revealed: Chieftain of the Pit gets +3 Attack until the end of the round. Shadow: attacking enemy attacks again after this attack. Deal it another shadow card for the next attack. 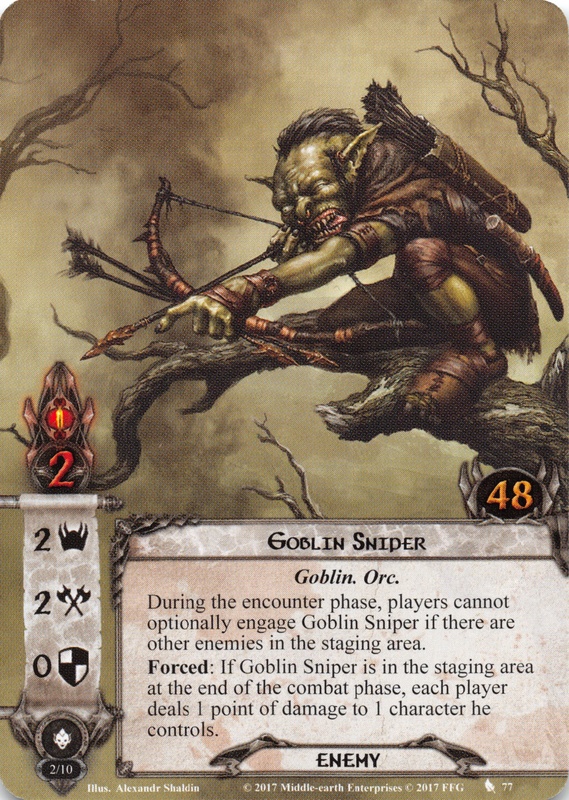 Players cannot optionally engaged Goblin Archer. 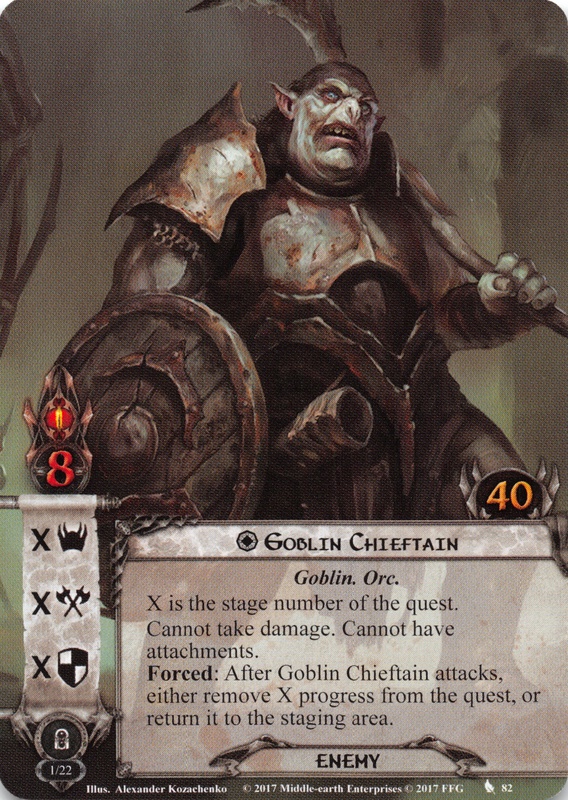 Characters with ranged are eligible to attack Goblin Archer while it is in the staging area.Forced: After an enemy is revealed from the encounter deck, the first player must deal 1 damage to 1 character he controls. When Revealed: Goblin Follower engages the last player. Each player with a threat of 25 or higher cannot optionally engage Goblin Scout. Goblin Spearman gets +2 Attack if its attack is undefended. Shadow: Add Goblin Spearman to the staging area. Goblin Swordsman gets +2 Attack if its attack is undefended. Shadow: Add Goblin Swordsman to the staging area. Forced: Before Patrol Leader is dealt damage, discard the top card of the encounter deck. If the discarded card is an enemy, cancel that damage. Shadow: Cancel all damage dealt to this enemy. Shadow: attacking enemy gets +X Attack. X is the number of players in the game. Mountain Goblin gets +1 Attack for each Mountain location in the staging area. Forced: After Goblin Taskmaster engages a player, that player deals 2 damage to 1 character he controls. 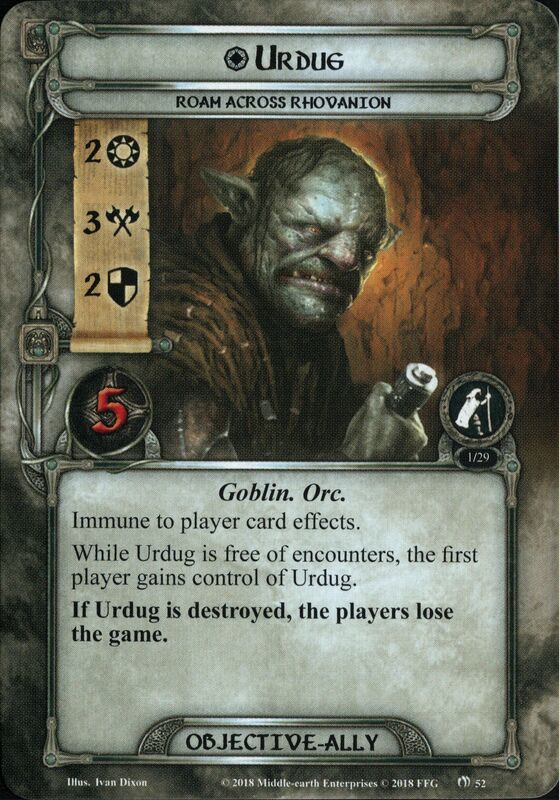 Forced: After Goblin Sneak engages a player, discard the top card of the encounter deck. If it is a treachery card, Goblin Sneak engages the next player, if able. Shadow: Add Goblin Sneak to the staging area. Lost: Each player must choose and discard 1 ally he controls from play, if able. Shadow: Trigger all 'Lost:' effects in play. When Revealed: Each player must deal 1 damage to a hero he controls. Forced: After a character leaves play, shuffle Ranging Goblin and the top card in the encounter discard pile back into the encounter deck. Shadow: Attacking enemy gets +1 Attack (+3 Attack instead if this attack is undefended). Immune to player card effects. While Urdug is free of encounters, the first player gains control of Urdug. If Urdug is destroyed, the players lose the game. Immune to player card effects. 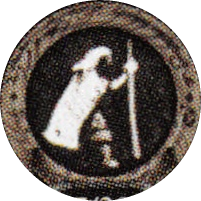 While Urdug is engaged with a player, he gains, "Forced: At the beginning of the quest phase, Urdug makes an immediate attack. If this attack deals damage, return Urdug and Tiny (if he is in play) to the staging area." Forced: After The Dragon’s Thrall engages you, either deal 3 damage to Hrogar’s Hill, or it makes an immediate attack against you. Shadow: If this attack destroys a character, deal 3 damage to Hrogar's Hill. When Revealed: The first player must either deal 2 damage to a hero he controls, or deal 3 damage to Hrogar's Hill. Shadow: Attacking enemy gets +1 Attack (+2 Attack instead if Hrogar's Hill has at least 25 damage on it). 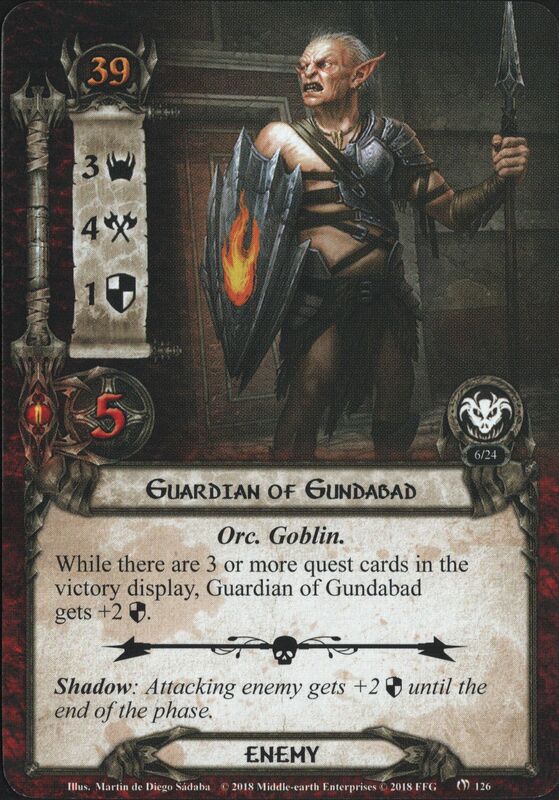 While there are 3 or more quest cards in the victory display, Guardian of Gundabad gets +2 Defense. Shadow: Attacking enemy gets +2 Defense until the end of the phase. Dagnir cannot take damage from non-quest effects. Shadow: Attacking enemy gets +1 Attack (+2 Attack instead if Dagnir is engaged with you). Goblin Axeman gets +1 Attack for each Cave location in play. Shadow: Defending character gets -1 Defense. If The Great Goblin is in the victory display, this card gains surge. When Revealed: The first player exhausts 1 character he controls. Shadow: Defending player exhausts 1 character he controls. Goblin Miners gets +1 Defense for each Cave location in play. Forced: After The Great Goblin attacks, discard X cards from the encounter deck where X is the number of players in the game. Add each Goblin enemy discarded by this effect to the staging area. Cannot have attachments. 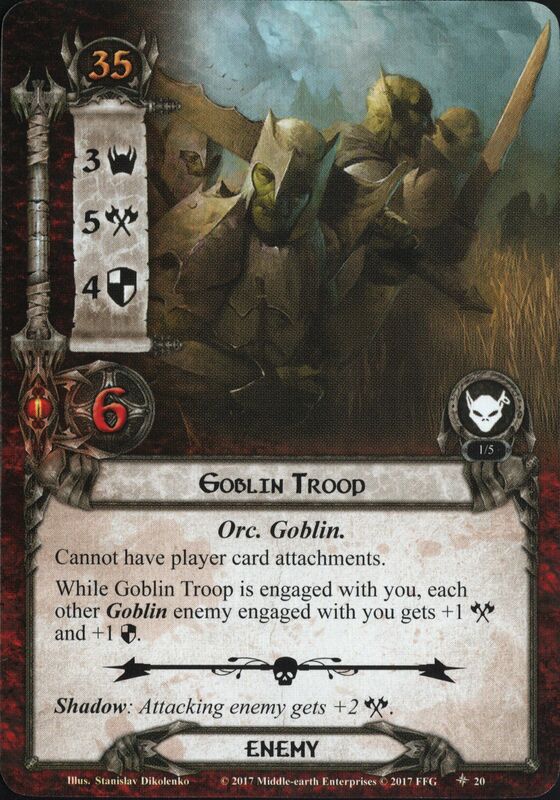 While Goblin Troop is engaged with you, each other Goblin enemy engaged with you gets +1 Attack and +1 Defense. During the encounter phase, players cannot optionally engage Goblin Sniper if there are other enemies in the staging area. Forced: If Goblin Sniper is in the staging area at the end of the combat phase, each player deals 1 point of damage to 1 character he controls. When Revealed: Discard the top card of each player's deck. 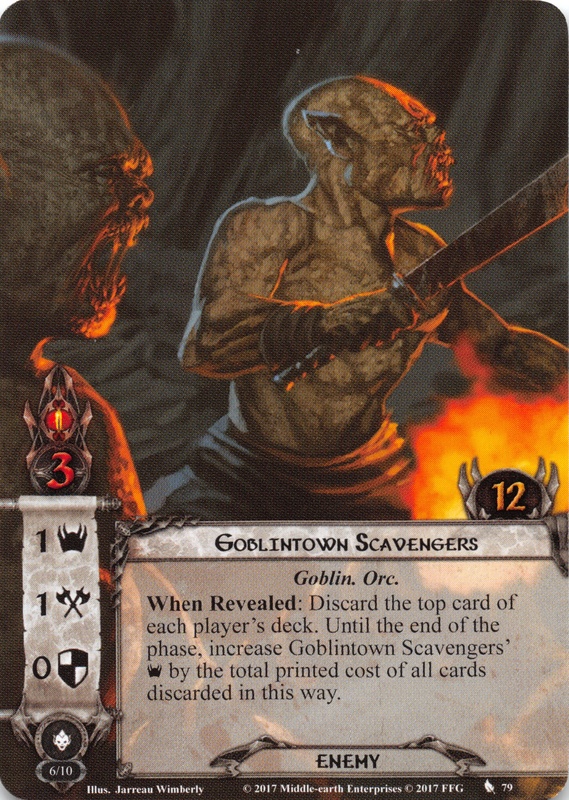 Until the end of the phase, increase Goblintown Savengers' Threat by the total printed cost of all cards discarded in this way. While a Loot objective is attached to a hero, Blue Mountain Goblin gains surge. 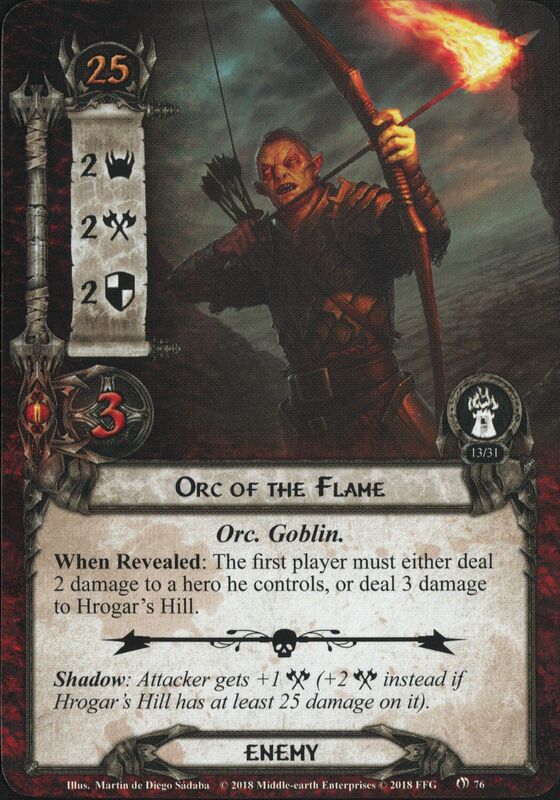 Shadow: If you control a Loot objective, put Blue Mountain Goblin into play engaged with you and deal it a shadow card. Cannot be optionally engaged. Forced: At the end of the combat phase, easy player deals 1 damage to a hero he controls. Shadow: Defending character does not count it's Defense. Shadow: If Wilyador has 10 or less damage on him, deal 2 damage to Wilyador. Cannot be optionally engaged. Forced: After the player guarding Gollum changes, Pursuing Warg-rider engages the player guarding Gollum and makes an immediate attack against that player. Forced: After Cave Torch exhausts, Patrol Sentry makes an immediate attack against the engaged player, if able. Shadow: Add Patrol Sentry to the staging area. Cannot be optionally engaged. 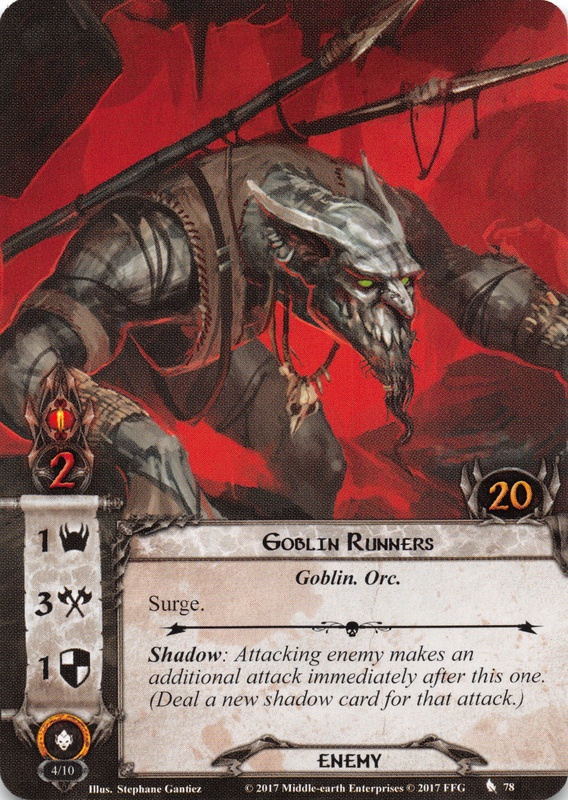 If the active location is a Dark location, Goblin Lurker gets +3 Attack and -40 engagement cost. Each Goblin enemy gets +1 Attack for each resource on it. This ability does not stack with other copies of Goblin Skirmisher. Shadow: Deal X damage to the defending character. X is the number of resources on attacking enemy. When Revealed: Add 2 resources to Pit Goblin. Shadow: If attacking enemy is a Goblin, add 1 resource to it. 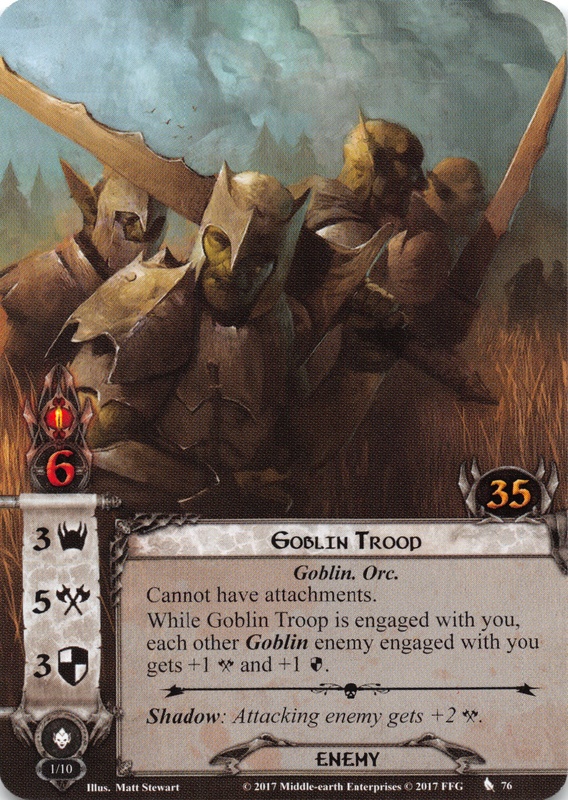 While you are engaged with Swarming Goblins, it gains: "Forced: When a quest card is bypassed, search the encounter discard pile for a copy of Goblin Spearman and put it into play engaged with you." Forced: After Goblin Trapper engages a player, that player must exhaust a character he controls. Shadow: Add Goblin Trapper to the staging area. While Vicious Tracker is engaged with a player, that player is considered to have +20 threat for purposes of engagement checks only. Forced: When Goblin Stalker attacks, deal it 1 additional shadow card. Forced: When Goblin Stalker is dealt a shadow card with 'PASS' printed in its text box, it gets +2 Attack until the end of the phase. Mithril Seeker gets +1 Attack for each resource on it. Forced: When Mithril Seeker attacks, move 1 resource from each of the defending player's heroes to Mithril Seeker. While you are engaged with Prison Guard, it gainst: "Planning Action: Rescue a random card from underneath Prison Guard. Then, raise each player's threat by X, where X is that card's printed cost. (Limit once per round)." Progress cannot be placed on the current quest. 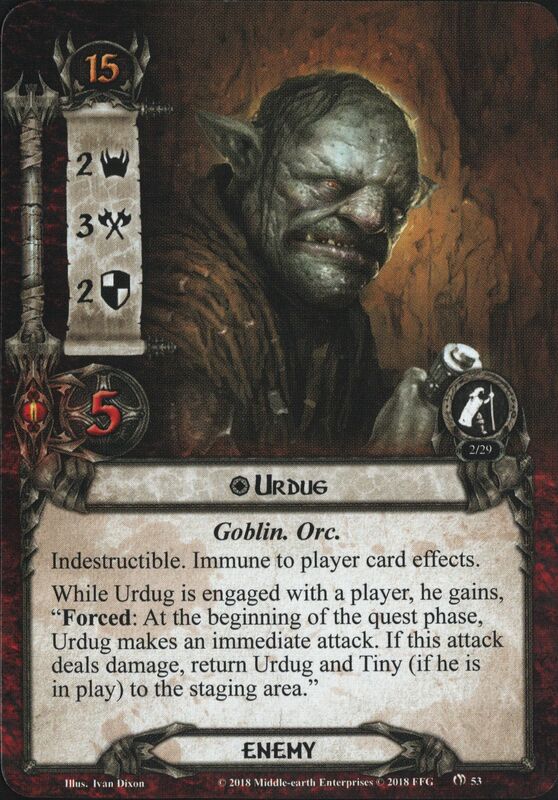 Forced: When The Great Goblin attacks, discard the top card of the encounter deck. 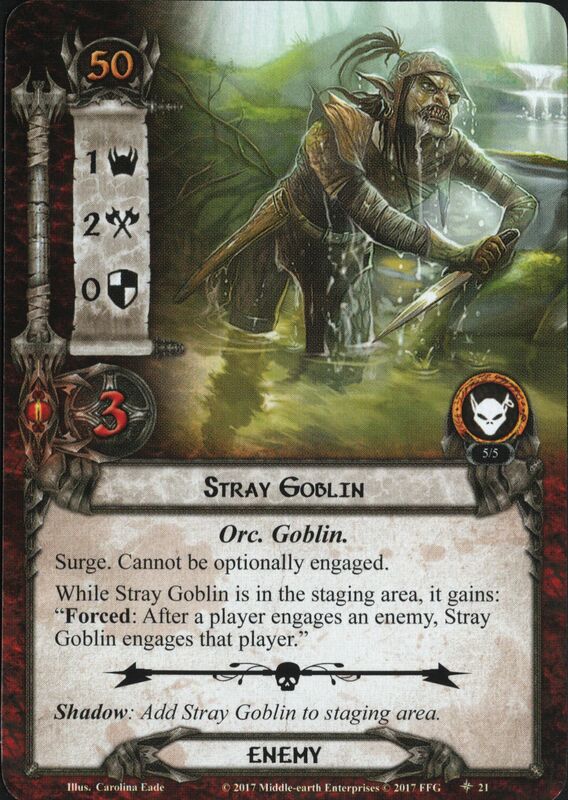 If it is a Goblin enemy, put it into play engaged with the defending player and deal it a shadow card. Goblin Prowler gets -30 engagement cost if The Great Goblin is in the victory display. Forced: When Goblin Prowler engages you, discard a character you control. Bilbo's Magic Ring does not ready during the refresh phase.